You have likely been told countless of times of the importance of sleep. As a child, as a teenager, and as an adult – your health at every life stage depends on sleep! Sleep plays a huge role in mental health. While you are asleep, your brain is forming new pathways to help you learn and remember. Being sleep deficient has been linked to risk-taking behaviours, depression and anxiety. Lack of sleep makes decision making, problem solving, and even just simple information processing very difficult. Sleep also plays a key role in physical health. Normal development as well as a well functioning immune system depend on sufficient sleep. Being sleep deficient will increase your risk for chronic diseases like heart disease, diabetes, and stroke. Additionally, the risk of obesity increases as sleep decreases. This is partially because sleep affects your body’s balance of the hormones ghrelin and leptin (hunger and fullness hormones). Your levels of ghrelin will actually rise as your levels of leptin go down when you are running on low sleep. 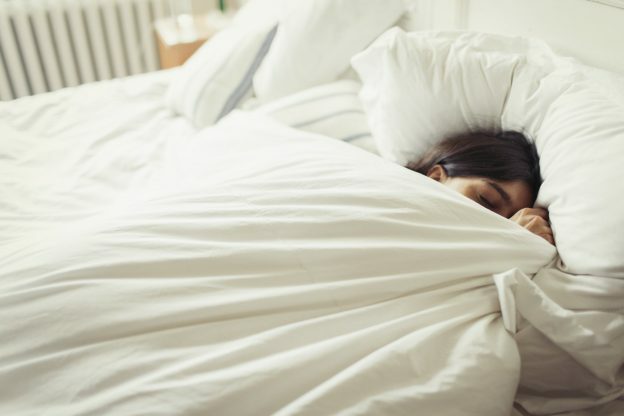 On a more basic level, getting enough sleep helps you to be the most alert, positive and productive version of yourself – and who wouldn’t want that? Sleep needs vary over different life stages, and even between different people. Your sleep needs could look very different from those of a family member or a friend. As a general guideline, 7-8 hours of sleep each night is recommended for adults over the age of 18. Then there is the issue of quantity vs. quality… is is better to sleep longer or deeper? Quality should be more of a priority when is comes to sleep. Getting 6 hours of high-quality deep sleep is more beneficial for health than a longer period of time in a low-quality sleep. So try various strategies to find out what works for you and your sleeping tendencies. Developing a relatively consistent nightly routine will help train your body to begin producing melatonin and preparing for sleep. What do you find helps you sleep? Let us know in the comments below!